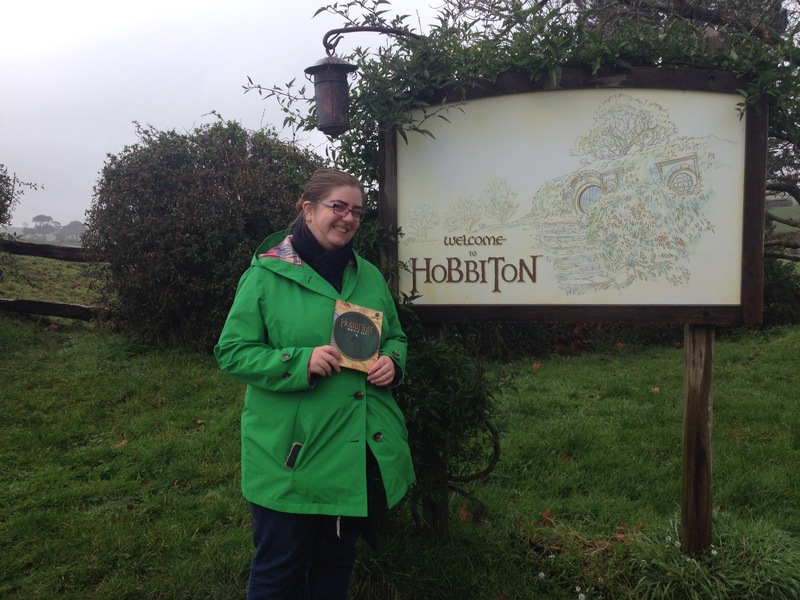 In honor of the birthdays of Bilbo and Frodo Baggins, also known as Hobbit Day, a write-up of this American’s recent journey to Hobbiton seemed appropriate. This summer, I visited my fiancé in New Zealand, known to most fantasy fans as the place where The Lord of the Rings and The Hobbit were filmed. (I’ve already written here about one of our culinary experiences.) We took a camper van from his hometown of Christchurch on the South Island to the North Island so we could travel around. He’d been itching to travel the country in such a manner for a long time. Our first stop in the North Island was Wellington. 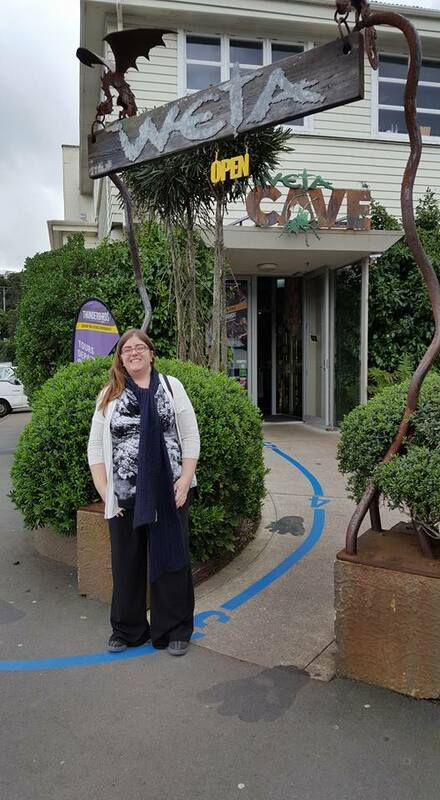 Once we arrived in Wellington, we knew we wanted to check out Weta Cave, home of the films’ props and special effects, and had an idea of what we wanted to visit along the way. Entrance to the Weta Cave. Arriving late, we stayed at a motel our first night so we’d be fresh faced for Weta Cave on our first of two days in Wellington. Set in a residential area, this is a film buff’s dream, complete with memorabilia ranging from many of the films they were involved with, but mostly from the Lord of the Rings and The Hobbit trilogies. As someone who has a love for the movies but not much technical knowledge, it was a fascinating start to the fandom aspect of the trip. 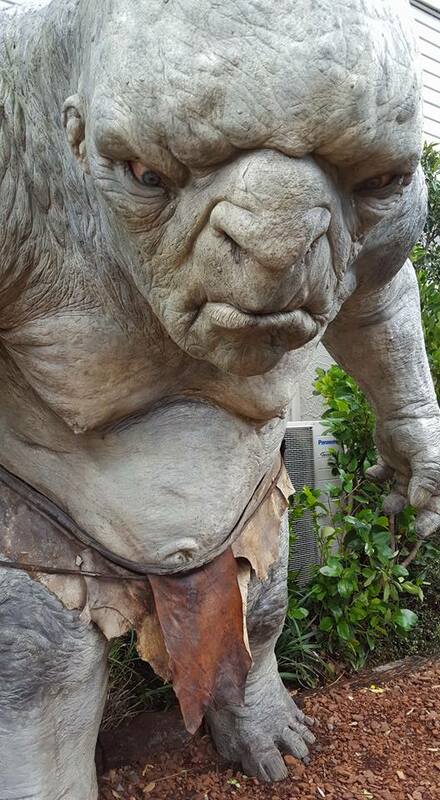 One of three larger-than-life trolls in the garden in front of Weta Cave. After we finished taking everything in at Weta Cave and doing other touristy things, we stayed the night in Wellington’s Kiwi Holiday Park. Unintentionally, we ended up staying right at the campsite where some of the filming happened—walkable to many of the locations in Lord of the Rings and set along the River Anduin, with Isengard 100 meters from the reception. Though we didn’t get any pictures, we could clearly hear the river as we walked about at night exploring what little we could in the rapidly diminishing light. 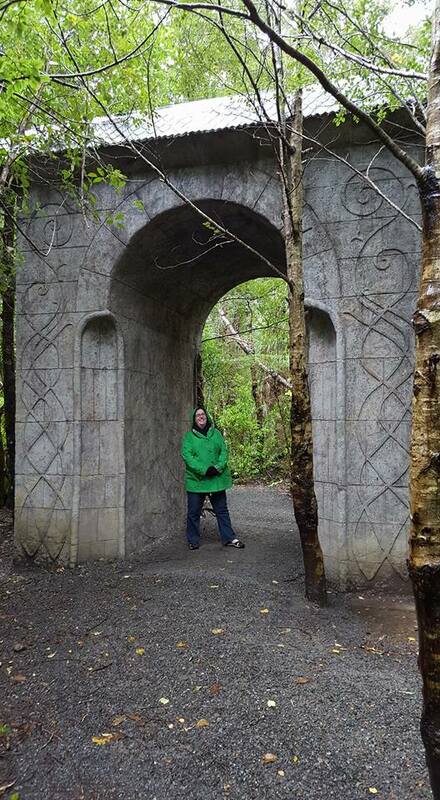 From there, we were able to drive 10 minutes to Rivendell on our second day in Wellington. After the short drive in light rain on narrow, windy roads, we arrived in the parking lot of the national park where Rivendell was filmed. Though much of it has reverted back to the original foliage and natural beauty, there are a few markers, like the one above. To walk the entirety from this point and back to the parking lot, it would have taken about 5 or 10 minutes if we didn’t stop. However, there were maps and information set up to tell visitors about where certain locations were relative to the map. And of course, the largest piece was the gate where Frodo asks the way to Mordor when the Fellowship leaves Rivendell. It’s smaller than the film-set one, but erected for the fans. Wellington is in the south of the North Island, and Hobbiton is situated much more in the northern part of the island. Though there were other Lord of the Rings touristy things we could have visited near Wellington, we were eager to depart to see other unrelated New Zealand sites. 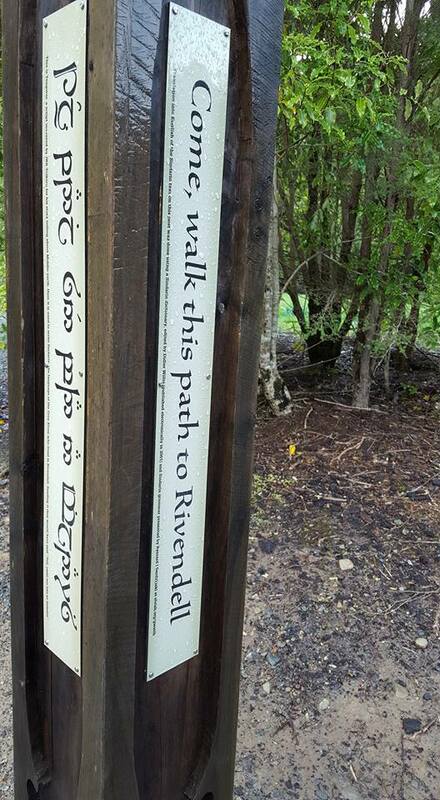 About a week after we visited Rivendell, we finally made it to Matamata and stayed at the campgrounds closest to Hobbiton. We arrived early in our camper van at the Shire’s Rest (as it was called), where all the tour buses depart and arrive. The bus ride took about 15 minutes with the driver explaining a lot of the history of how the site was chosen for Hobbiton. Situated on a sheep farm, it is jointly owned by the farming family and the filming company. Much of this information from this part of the tour can be found at the website. 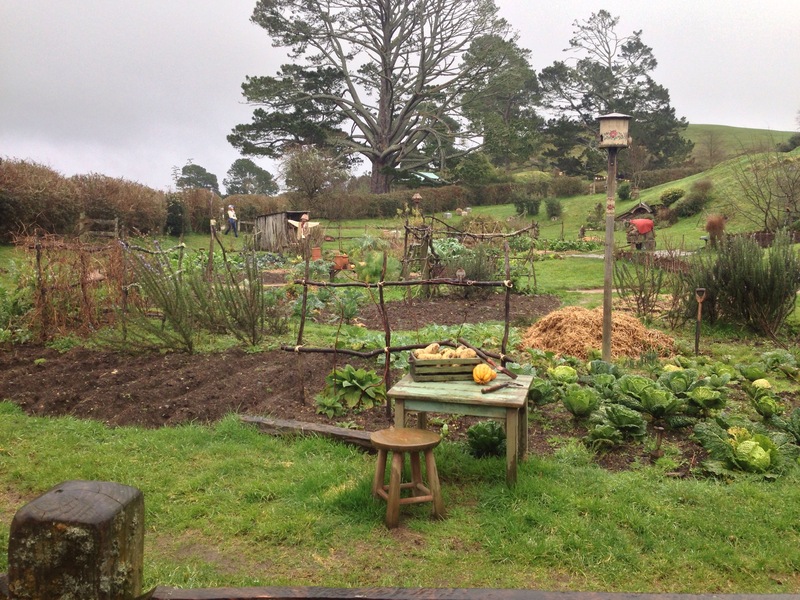 Off the bus, the entrance to Hobbiton. The tour through the Shire, with a guide, took about an hour. He was quite informative on the façades of the homes: which ones were used for forced perspective with humans versus hobbits, where certain scenes took place, and where Samwise lived after marrying and having kids. It was well kept and meant to look as though the hobbits still live there, complete with gardens, clotheslines, smoke coming out of certain chimneys, and apple trees with fresh apples ready to be picked. One of the common areas of the Shire. 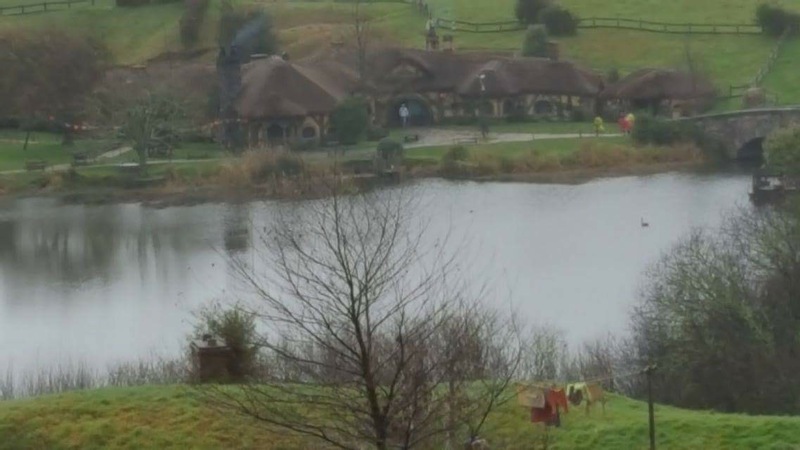 The Green Dragon Inn from vantage point of Bag End. 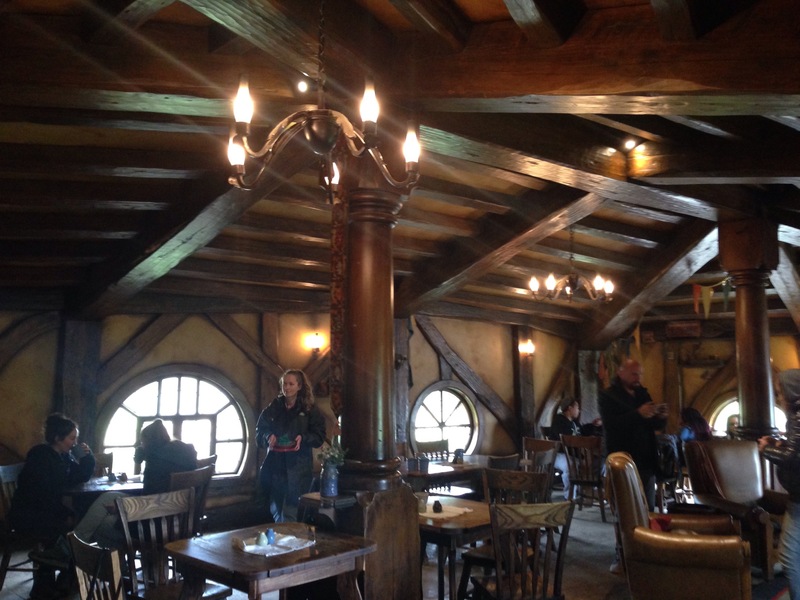 One of the more interesting things about the tour, I thought, was that the Green Dragon Inn serves three beverages that are brewed on site specifically for Hobbiton and are sold nowhere else. Each tourist gets a free root beer, ale, or hard apple cider upon entrance to the tavern as the final part of the tour. 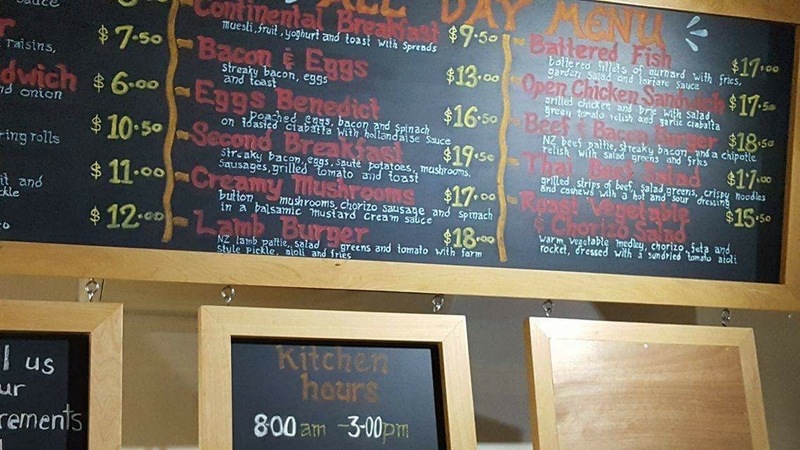 There are small bites to purchase, including lamb stew—which was woefully lacking in potatoes. The common room at the Green Dragon. There’s a fire in the Shire—thankfully, in a fireplace. Once our 15 minutes were up, the bus was there to take us back to the Shire’s Rest. This also houses a fantastic gift shop where you can buy shirts, books, postcards, memorabilia, and any of the bottled drinks made for Hobbiton. At the entrance there’s a cute little mailbox to send postcards, and above the shop is a full restaurant, which includes menu items for second breakfast and elevensies. 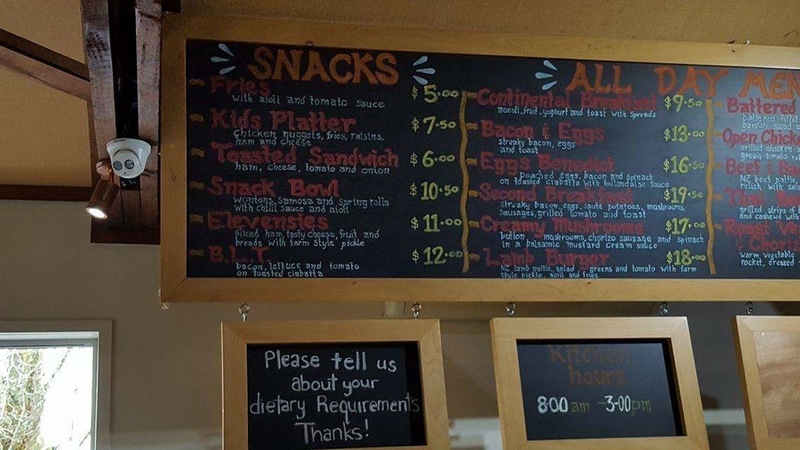 One of the nice things was that they were very conscientious of dietary needs, making it helpful for tourists of all sorts. Though it was drizzling at the beginning of the tour, by the time we were able to eat, it was a rather warm winter day, albeit intermittently sunny. If you ever decide to make this journey for yourself, I highly recommend purchasing tickets to ensure your spot on a tour. It’s likely that summertime would be busiest, but it was busy in the winter as well. If you go between June and August and intend on camping, it is likely to be cheaper to stay at campgrounds than at a hotel. It’s only a couple hours outside of Auckland, which has a major international airport. 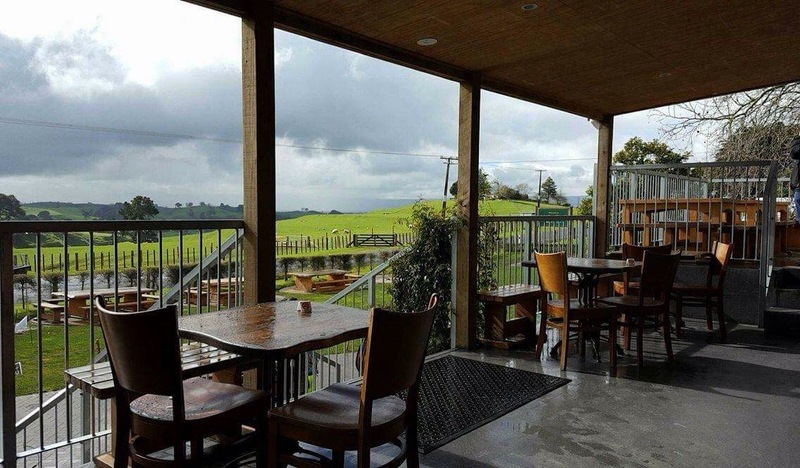 It’s easy to fly there and rent a car to Matamata. All together, a highly recommended trip for any geeky Minnesotan! This sounds so amazing! This is definitely on my bucket list of places to travel to.